Luckily, according to the Internet (what would I do without it! get a “proper” job I guess) there’s a well known algorithm to solve this problem. 🙂 and it would go more or less like this. Grab a random node from the graph, and add it to a new set. Now get all the neighbors of this node, discard the ones we already visited (so we don’t get stuck in an infinite loop), add them to the set, and keep doing the same thing from the beginning with each neighbor, recursively. When we’re done visiting neighbors, that means we finished finding one of the connected components – we can start over with a new random node we haven’t visited yet to find the next connected component, and so on until we visited all the nodes. Confused? Let’s start over, this time with an example. In the above example we’d start with a set containing 5 nodes (A through E), where B is connected to A and D, and C is connected to E. So let’s pick a random node, say C. We paint C in blue and get the neighbors, in this case it’s just E. Now we visit E, so we paint it blue and get the neighbors, now it’s C again. Since we already visited C (we know because it’s already painted blue) we discard it. Now we have no more nodes to visit, so we’re finished getting the first connected component. But that was the easy one, and we’ve still got 3 more nodes to go. Let’s pick a random one from the ones we didn’t visit yet, that is, the nodes that remain gray (A, B and D), for example A. We paint it green and get the neighbors, which is just B. Now we visit B, paint it green and get the neighbors, A and D. But A was already visited (it’s green already) so we discard it, leaving only D. Finally we visit D, paint it green, and get its neighbor B. Since B was already visited we discard it. This leaves no more nodes to visit, and we’re finished. But what was the problem I was trying to solve? During the execution of the program, we have a given number of plugins all running concurrently, and a series of messages with data that are sent to each plugin for processing. Each plugin may also create new data objects and send them to the main process, who in turn re-sends it to the rest of the plugins. For example, the Web Spider plugin would crawl a website and create URL objects for each link it finds, and HTML objects for each page it downloads; then those objects are sent to other plugins that would analyze the URLs and the HTML pages looking for vulnerabilities, and creating Vulnerability objects describing each vulnerability they find. Another plugin may receive a vulnerability and exploit it -for example, an URL disclosure vulnerability- creating new URL objects, which in turn get sent to the Web Spider for crawling, and so on. The data objects also contain references to each other — for example, if a data object contains an HTML page, it’ll also have a reference to another data object with the URL where it was found, and vice versa. If a vulnerability is found in that page, another data object will be generated with the description of the vulnerability, and it will also reference the URL where the vulnerability was found. The URL, in turn, will reference the vulnerability that was found on it. More generally, this leaves us with an undirected graph of data objects, since any data object can reference any other data object, but references always go back and forth. Also, we store every data object in a database, where they can be consulted at any time by a plugin. Now, this would be the problem: before we can send any data object to a running plugin, we have to make sure all other data objects it references are already stored in the database — otherwise, we might run into a race condition between the time the data object is sent to the plugins and the objects it references are stored in the database. If we fail to solve this, a plugin would occasionally find a data object references another object that can’t be found in the database. To prevent this, a simple algorithm was needed to find clusters of objects that reference each other (a connected component). So as plugins send messages to the main process, the main process holds them until it can be sure it has a group of objects that aren’t referencing any data that hasn’t yet arrived. When the whole cluster is complete, it’s stored in the database and sent to the rest of the plugins. Enough of this nonsense already, where’s the example code?! 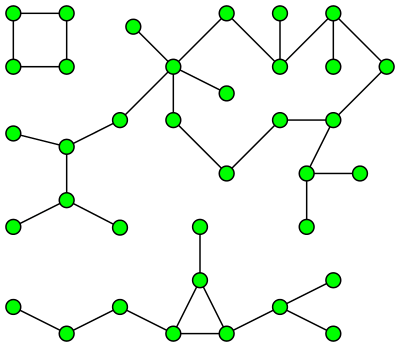 # Finding connected components in a bidirectional graph. # The function to look for connected components. # List of connected components found. The order is random. # Make a copy of the set, so we can modify it. # Iterate while we still have nodes to process. # Get a random node and remove it from the global set. # This set will contain the next group of nodes connected to each other. # Build a queue with this node in it. # When it's empty, we finished visiting a group of connected nodes. # Consume the next item from the queue. # Remove the neighbors we already visited. # Remove the remaining nodes from the global set. # Add them to the group of connected nodes. # Add them to the queue, so we visit them in the next iterations. # Add the group to the list of groups. # Return the list of groups. # The first group, let's make a tree. # The second group, let's leave a single, isolated node. # The third group, let's make a cycle. # Put all the nodes together in one big set. # Find all the connected components. You’re right, it wasn’t working. I’ve just fixed it. Thanks! For me is usefull to resolve parallel task execution and network availability/minimal performance problems, using critical path method (CPM) and PERT, according of the context, I translate the variables “employed”, “item”,”event”… by resources like bandwidth needs, computing cost, and the different kind of “time” by aproximations values of process complexity , medium time desired, or others variables which limit or condition the problem. The best thing of all, it is very easy to optimization expressing the graph as a matrix, and after applying, the critical path algorithm for obtain all possibles parallels tasks and their executions orders.